If you work in the kitchen on daily basis, you must be familiar with garbage disposal units. They are great kitchen appliances and can save a lot of time by grinding food leftovers to small pieces. They come with different horse-power, sizes and shapes and noise levels. But the most powerful models are often extremely noisy, so we will take a look at the quietest garbage disposals on the market. The noise level is something you should definitely consider. But which garbage disposal is the quietest? To what should you compare the noise if this is going to be your first disposal? Should you trust sound-proof technology or simply look at the decibel level? Well, fear not! 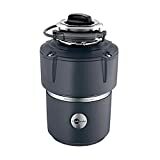 To spare you time and effort searching for the quietest garbage disposal, I’ve put together a list of 5 quietest garbage disposal units on the market. Here you can compare horsepower, size, weight and decibel level of each model. Note: Just to give you a real-life noise example, a typical household vacuum cleaner on medium settings is about 85dB (decibels) loud. The list of 5 quietest garbage disposals begins with InSinkErator ProCCPlus Pro Series with ¾ HP. This particular model isn’t the cheapest one on the market, but is definitely one of the quietest out there. With the Sound Seal Plus technology, the ProCCPlus is at least 60% quieter than most garbage disposals. Huge 40-Ounce Stainless Steel Grind Chamber and Grind Components handle more volume than most disposers. However, you must consider the available space under your sink, because this fella is quite huge, the dimensions are 15 x 15 x 21 in and the weight is 20.2 pounds. InSinkErator brand is very well known because of their Sound-seal technologies, which effectively put them on top in regard to noise level. ProCCPlus’s noise level is 85 dB at max peak while only 65 dB during normal run. 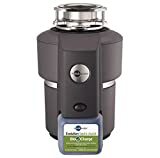 Another quiet garbage disposal beast from the InSinkErator brand, Evolution Excel 1.0 HP delivers massive performance with stony silence. Due to famous SoundSeal technology, the disposal is very quiet despite its great 1.0 Horse-power. Actually, after looking on the internet for hours and checking user reviews, Evolution Excel is probably the quietest 1.0 HP (if not quietest in general) garbage disposal on the market as of now. Other features that are worth mentioning are 40 oz. Stainless steel grind chamber, Multi-Grind technology and 7-years In-Home Limited Warranty. The dimensions are 12 x 12 x 13 inches and the weight is 25.5 lbs. According to the manufacturer, the noise peak is 45 dB, while on normal run the noise output is only 25 dB, which is pretty great. The Waste King L-8000 is one of the best models out there in general, but what is often left out is the fact that it’s also one of the quietest models out there. While it does not have the SoundSeal technology of InSinkErator, it does come with the 1 HP, 2800 RPM permanent magnet motor that is sound-insulated. The L-8000 also includes all-stainless steel grind components; lifetime limited In-home warranty and pre-installed power cord. Not to mention that it’s far cheaper compared to the quietest models of InSinkErator. The size is 8.5 x 8.5 x 16 inches and its weight is 11.94 pounds. All in all, legend 8000 definitely makes it to the list of the 5 quietest garbage disposals. 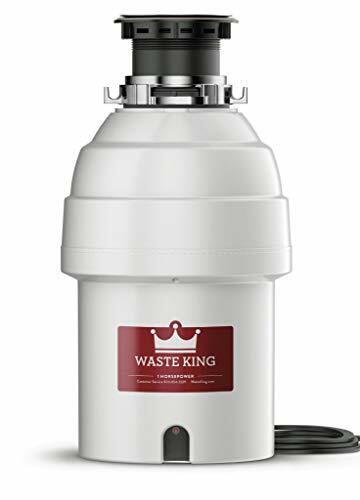 Waste King offers tens of garbage disposal units and while not every one of them is quit, we can safely say that L-8000 is. With the noise peak at 95 dB and normal run at 80 dB, it is considered one of them quietest out there. 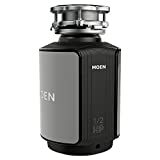 While Moen does not have as wide selection of garbage disposal units as other brands, GX50C is definitely worth mentioning in regard to noise. 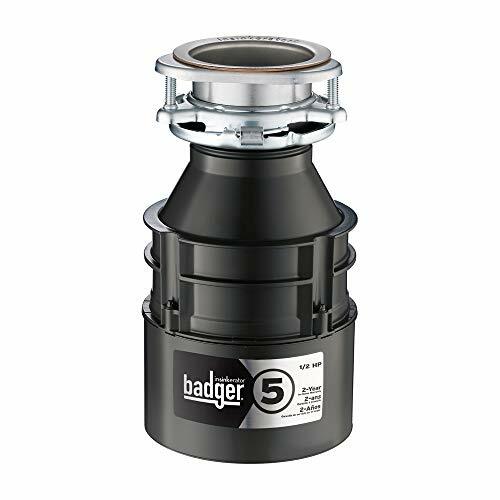 It operates at 2600 RPM, ½ HP with the high-speed Vortex permanent magnet motor and due to the SoundSHIELD sound insulation technology; it’s less noisy than other standard garbage disposals with similar parameters and definitely belongs among other quiet garbage disposals. Other features worth mentioning are removable splashguard, polished stainless steels drain stopper and drain elbow and mounting assembly. If you need a good quality ½ HP garbage disposal without the extra noise and don’t want to spend a lot of money, definitely go for GX50C. Moen’s dimensions are 7.5 x 7.5 x 16 inches and the weight is 13 lbs. The only Moen on our list, coming with the noise output at 95 dB at peak and 70 dB during normal run, it definitely deserves a spot on our list. 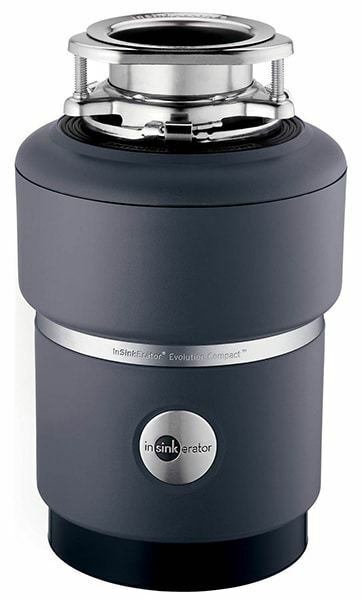 I know, it may look like I’m favoring the InSinkErator brand, but since we are reviewing the quietest garbage disposals on the market, InSinkErator offers the widest range of disposal units in this regard. Evolution Septic Assist is no different and it deserves a place on our list. As with other two InSinkErators mentioned in this article, Evolution Septic Assist comes with the SoundSeal technology as well, but this particular model also includes septic garbage disposal Bio-Charge cartridge technology to break down food wastes while controlling odor. ¾ Horse-power Dura-Drive motor takes care of every food chunk you put in with the 2-stage grind operation. 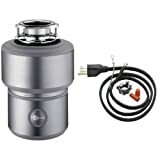 I just love the fact that InSinkErator can make powerful, yet quiet garbage disposals. While the installation is easy, this model does not come with a power cord, so you need to purchase it separately. Product’s dimensions are 14 x 11 x 16 inches and the weight is 22.3 pounds. IE Septic Assist with its greatly-designed Sound-seal technology peaks at 65 dB while during standard run, the noise output is only 45 dB, thus deserving a spot on our list. Huge Garbage Disposal – check the space under your sink! BioCharge Enzyme needs to be refilled once in a while. There goes our list of the five quietest garbage disposal units on the market. In most cases brands like Waste King or InSinkErator don’t include the decibel level range of their models, so I had to check that manually with my disposal and also reach out to my friends regarding that. I’m happy to tell you that I was able to get all the decibel-level details for each model, so I hope that I made your life easier with this selection and you are now able to grab the one that suits your needs.